1881. When the star and owner of the Lyceum, Mr. Henry Irving, is poisoned on Hamlet’s opening night, it’s up to stage manager Harry Rivers to make sure the show goes on. Fortunately for Harry, Mr. Irving is able to pull through and walk the boards as planned. But when his understudy is killed the very next day, Harry’s boss, Bram Stoker, becomes convinced that foul play is afoot. 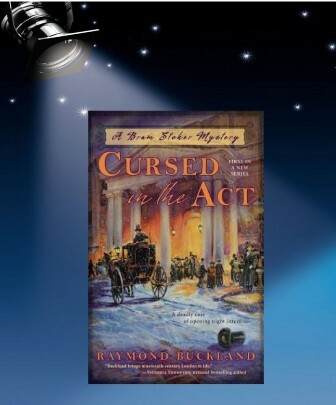 Find out more about Raymond Buckland and his books here. This sounds very intriguing, and looking at the books he’s written a very interesting looking collection. It looks like another author to add to my tbr list. Mystery is afoot. Sounds really fun and noirish. I pre-ordered your book, Ray. Wanted to make sure I got it immediately and can’t wait to read it! This sounds like such a fabulous read! It is on my TBR. Special Guest – Victoria Laurie – Author of The Ghoul Next Door (Giveaway too!) No Strings Attached Giveaway Hop! !